The GNU Hyak men's snowboard will take you for a ride of infinite opportunity, in either direction you choose to ride it. 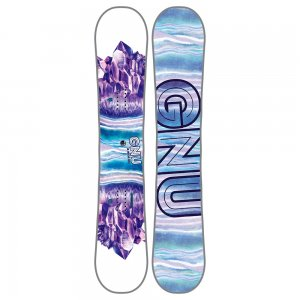 The GNU B-Nice Minerals women's board has a 'can-do' attitude to take on any terrain in front of it. With friendly Original Banana contour, perfect for progress, it performs across the whole mountain. 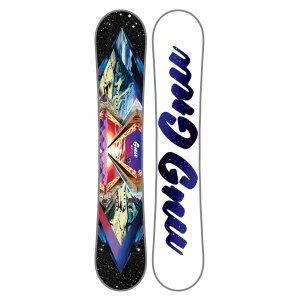 GNU B Pro C3 BTX women's board brings carefully curated, aggressive all-mountain freestyle geometries and 20 yrs. of refinement to the table. Take on deep pow and epic park laps with tricked-out tech. Certified by pipe champ Kaitlyn Farrington, this women's snowboard combines award-winning B-Pro performance with GNU Gold Metal Technology for freestyle freedom and precise control. Podium topping and jaw dropping, the GNU Ladies' Choice ASYM C2 BTX women's snowboard is Jamie Anderson's choice for all-mountain freestyle riding. 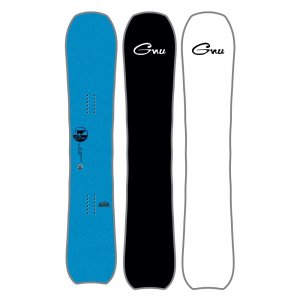 Perfect for all your freestyle fun on the slopes, the Ladies Choice Jamie Gold snowboard delivers intuitive control and easy turns with its asymmetric shape. Offering balance through asymmetry, the women's GNU Smart Pickle PBTX Snowboard sports an asymmetric design that matches the unique mechanics of toe- and heel-side turns for easy, intuitive control.